Formed by Frank P. Thompson, headwaiter of the Argyle Hotel in Babylon, Long Island, New York, and Stanislaus Kostka “Cos” Govern, who acted as manager, the Cuban Giants were the first salaried black baseball team. They began play in August of 1885 and took on their first major-league opponent, the American Association Metropolitans, on October 5 of that year. The Cubans weren’t ready for such fast company yet and the Metropolitans jumped off to a nine-run lead in the top of the first on their way to an 11-3 victory in a game called after six innings on account of darkness. One such game took place at Trenton, New Jersey, on July 21, 1886, against the American Association’s Cincinnati team, and it gave the Cuban Giants a chance to prove that a black baseball club could compete on an even basis with a big-league team. Although not an Association powerhouse, the Reds were a competent Association club, carrying a 38–40 record into the game, which was fitted between the end of a three-game series in Philadelphia and the start of one in Baltimore. The Reds lineup included several familiar names, among them Bid McPhee, Pop Corkhill, Charley Jones, and Hick Carpenter. Famed pitcher Tony Mullane took part, although he played outfield. A standing-room-only crowd filled the stadium in Trenton as the home-team Cubans took the field. Clarence Williams put the Cubans ahead in the first inning, scoring on a single and two stolen bases. The score remained 1–0 when Cubans pitcher Shepard “Shep” Trusty led off the third with a walk. That touched off a five-run inning that included doubles by Jack Fry and Abe Harrison. In the bottom of the third, Charley Jones of the Reds reached base on an error, moved to second on a single and scored on another single. 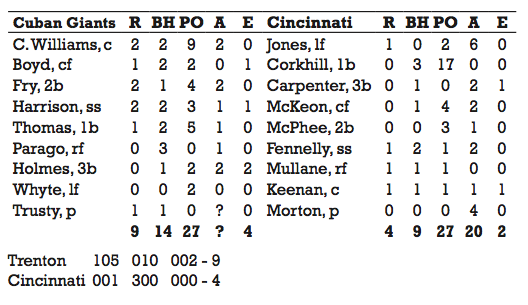 The Reds added three more runs in the fourth when Jim Keenan doubled to drive home Frank Fennelly and Tony Mullane, who had both reached on errors by third baseman Ben Holmes. Keenan reached home on a passed ball. The Reds were not too happy about their loss. The July 22, 1886, Cincinnati Commercial Tribune lamented that there had been no report sent of the game and they were not even sure it had been played. The five players listed by Malloy were Clarence Williams, Boyd, Fry, Harrison, and Thomas. Abraham “Abe” Harrison played with the Orions at the time of the creation of the Cuban Giants, and Benjamin “Ben” Boyd was with the Keystone Athletics. The other players came later. Arthur Thomas had played with the semipro Manhattan of Washington in 1880 and the West End of Long Branch in 1881 and 1882 before joining the Cubans in 1885. Clarence Williams played with a team in Harrisburg in 1882 and neighboring Middleton in 1883. He started 1885 with the professional Williamsport team before joining the Cuban Giants later that season. Fry came partway through the 1886 season from Lewistown of the mostly white Pennsylvania State Association. The Cuban Giants were year-round professionals, committed to doing whatever it took to compete on the ballfield. Sometimes that meant going to unusual lengths. In 1885 they established the pattern of playing their way through the South on their way to Florida in the fall. They then played ball and waited tables at the Hotel Ponce de Leon, in St. Augustine. As the weather began to improve, the team would play its way back north in preparation for the coming year’s season. While in Florida, there are reports that they played in Cuba. 1. 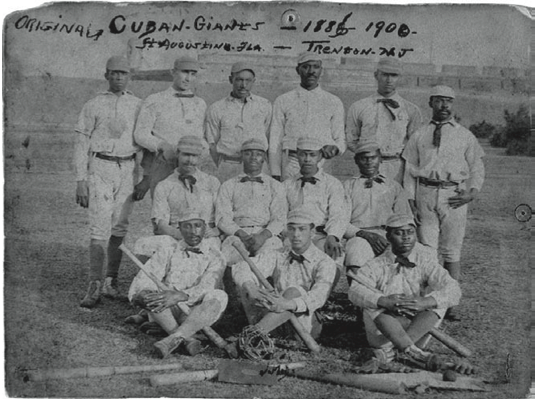 Most of the information on the early development of the Cuban Giants is drawn from Sol White’s History of Colored Baseball and Michael E. Lomax’s Black Baseball Entrepreneurs, 1860-1901. 2. The game account paraphrases a report in “A Glorious Victory,” Trenton Times, July 22, 1886, copy provided by SABR member Gary Fink. 3. White, Sol, introduction by Jerry Malloy. Sol White’s History of Colored Base Ball with other documents of the early Black game, 1886-1936. (Lincoln and London: University of Nebraska Press, 1995.) p.10.